Note: read my original review of Annabelle here. If we were ever compelled to consider the horror genre as an arms race between studio’s, let’s look no further than the case of The Conjuring. It wasn’t enough for Warner Brothers to announce an inevitable sequel to James Wan’s smash hit for 2015—this genre practically demands an entry a year if you’re going to be a true contender. 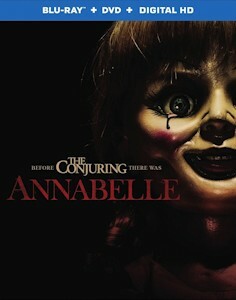 Rather than wait around, the studio looked to keep the seat warm with Annabelle, a spin-off involving the original film’s de facto mascot. Admittedly, it’s a clever workaround in theory and something I wouldn’t mind seeing more of in lieu of cheap, hastily-produced sequels. Of course, the problem with Annabelle is that it still winds up feeling like that anyway—it’s an aside that doesn’t necessarily affect the franchise going forward, but it’s a lackluster brand extension all the same. The umpteenth riff on a mish-mash of genres, Annabelle follows every conceivable template imaginable: it’s a haunted house film, a demonic possession film, a Rosemary’s Baby homage (the main characters are even named Mia and John), etc. As a prequel or spin-off, its existence might be relatively unique from most horror sequels in its conception, but it hardly does much more to separate itself from the pack in its execution. Few would argue that The Conjuring itself was fresh upon its release, particularly given the glut of paranormal movies in recent years. After all, it, too, was the umpteenth riff on a sub-genre, albeit one elevated by a director with a clear sense of style and suspense. You’ve likely heard the oft-repeated refrain about an old story being well told, and The Conjuring is a sterling example of such a film. On the other hand, Annabelle serves as a similarly fine case of a film that struggles to rise above its stultifying familiarity. Having served as a cinematographer for nearly 25 years (and Wan’s DP of choice for the past decade), John R. Leonetti is a steady, reliable hand but rarely seeks to infuse an unimaginative script with the verve or style of his predecessor. Save for sequences involving a home invasion and a demon haunting a character in the bowels of an apartment building, Annabelle coasts on rusty rails through a flimsy funhouse of tired scares. Never does it fully take advantage of its period setting (the unfolds in the shadow of Manson and 60s hangover paranoia), nor does it ever shake the feeling that it’s just a diet version of the films Wan has directed during the past few years. Most disappointingly, it never makes a case for itself beyond exploiting the latest horror icon. After scaring up an impressive gross at the box office (thus justifying its existence on at least one level), Annabelle hits home video with a nice DVD/Blu-ray combo pack from Warner Brothers. The high-definition presentation nicely preserves the film’s slick visual palette, while the 5.1 DTS-MA track fills out the soundstage rather amply. As the latest bump-in-the-night thriller, it relies on jarring sound cues and Joseph Bishara’s frenzied score, both of which are reproduced faithfully here. The disc’s supplements feature a quartet of featurettes, with each running about five minutes apiece. Each is dedicated to a particular aspect of the production and amounts to some pretty decent fluff from the cast and crew. One of them does provide a cool look at how the crew filmed the home invasion sequence with an impressive long take, which gives one a new appreciation for how much effort went into this scene. (It might leave you wondering why the film is otherwise so bereft of similar inventiveness). Finally, about 20 minutes of deleted scenes allow viewers to see some material that was rightfully left on the cutting room floor. Some of the scenes are simply redundant, while others paint the apartment complex as an even more absurdly haunted building as Mia and John encounter more creepy tenants (and a fussy water faucet). On the whole, it’s an adequate release for a film seemingly engineered to be completely adequate. In professional wrestling parlance, Annabelle is an example of a franchise simply keeping its face on TV so audiences won’t forget it’s around. It’s a placeholder, meant to fill out the undercard until the proper Conjuring sequel arrives in the main event next year. In the end, Warner’s reluctance to quickly cash in has paid off, as Wan will be around to helm it after all. Hopefully, Annabelle will be put away for a while in order to rest her face. You know a horror icon risks overexposure when it's parodied before it makes its first solo outing.